The Dellorto DHLA 45 carburetors used on the Lotus Esprit S1 are a vibrant component of the engine seen through the rear decklid glass. I spent a lot of time on these to make sure they looked like new in addition to getting them to work properly. After taking everything apart, all of the internals were heavily varnished so it was essential to clean them multiple times to remove the deposits. From there, the rebuild process was easy once I had all of the parts (new rebuild kits, new idle jets, pump jets, main jets, and air correctors). I had all of the steel parts plated to restore their original appearance, purchased a set of Misab sealing plates, as well as a new intake manifold gasket so I could bolt everything back up. The job wasn’t difficult, but it did require a lot of patience and some research to make sure I was purchasing the correct size jets (I had no idea if the old ones were correct or not), and to polish all of the parts prior to plating so they came out perfect. 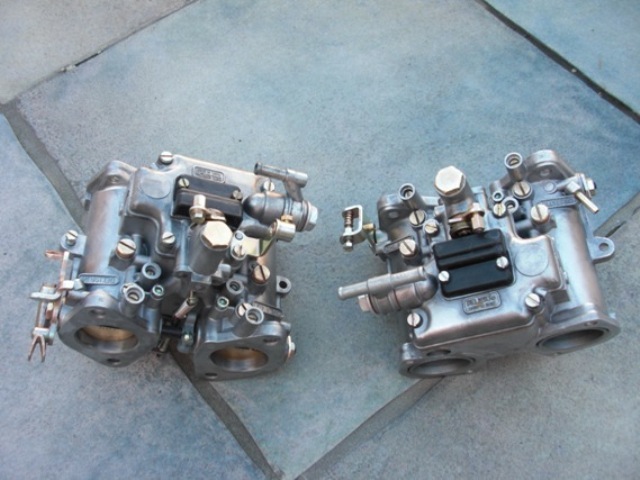 The Dellorto DHLA 45 carburetors after having been removed from the car. The rebuilt carburetors minus the intake horns, some linkage, and the intake manifold. The complete Dellorto DHLA 45 setup ready to mount to the engine. They looks so good you could put them in a display cabinet and look at them all day! What size trumpets did you use? I have a friend selling a set that are 6cm long however I am not sure if they will fit in the engine bay once the cover is back on. Do you do the zinc coating work yourself? We have no specialist here in Malta, might have to look at getting myself a kit!